Canadian bank looking to expand its footprint in the jurisdiction with new branch in New Providence. The new location will employ 10 staff and open in the summer next year. Scotiabank (Bahamas) Ltd will be opening a new $1-million branch next year, its new managing director, Canadian Kevin Teslyk (pictured), announced Monday. The new Carmichael location will be the bank’s 23rd branch nation-wide. It is expected to have a staff complement of 10. Presently, the financial institution employs 700-plus workers across The Bahamas and has 57 ATMs. 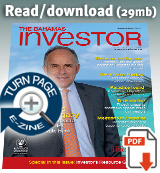 “Carmichael is one of the fastest growing, if not the fastest growing residential community in The Bahamas,”?said Teslyk. The new MD is optimistic that the site preparation and ground breaking can begin this month. Construction is expected to last six to seven months, wrapping up in June/July 2012. Officials hope to officially open the branch in the fourth quarter of next year. At some point in the future the bank hopes to enhance its delivery capability to customers by branching out in the eastern district of New Providence and perhaps expand operations in Freeport, Grand Bahama. The latter is Scotia’s largest single branch in The Bahamas. Teslyk admits that it has been difficult over the past three years amid the global economic turmoil. “Difficult times bring their own opportunities and we have a number of clients that are looking to leverage those opportunities to expand and to grow when you might least expect it,” the managing director advised. In 2012, one of the bank’s key priorities will be to continue to work very closely with all of customers across all business lines:?retail, small business, corporate, commercial and wealth management. Most of the bank’s clients, however, are interested in learning how to enhance and “right size” their operations with a view to becoming more efficient and effective so that they are well positioned to participate in rapid growth once the global economy recovers. 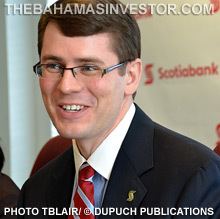 Teslyk assumed his current position as managing director of Scotiabank (Bahamas) in June 2011, taking over from Bahamian Barry Malcolm, who retired from his post of three years on May 31. Every year thousands of Canadians escape the winter chills to head for the region and The Bahamas is the perfect family getaway, claims the Toronto Sun. Swimming, parasailing, diving and "endless" duty free shopping bring visitors back year after year. New managing director at Scotiabank (Bahamas) says opportunities exist in the region particularly in wealth management and offshore and corporate financial services.